Sailfish Catamarans burst on to the Australian boating scene way back in January 1993 with their impressive locally manufactured aluminium twin hull designs that hit the mark with Australian sportsfishers, divers and nomadic seafarers. Twenty five years on Sailfish have risen from humble beginnings to become one of Australia’s most successful marine manufacturers. Sailfish have always offered a blend of seaworthy, offshore capable packages with maximised hull efficiency delivering huge volume, deck space and stability; and all wrapped up into towable sized packages. They pack enormous facility into the compact dimensions and weigh considerably less than equivalent fibreglass boats with similar purpose enhanced by their innovations in alloy trailer construction. Sailfish offer a range of cabin layouts and options to suit long range sojourns and weekenders, but mostly with a leaning toward enhanced outdoor facilities for day sports. Sailfish Catamarans Darren Foster commenced his career building aluminium catamarans in 1984. He started from humble beginnings in a little factory in the Northern Rivers NSW township of Alstonville with two staff producing five boats a year. They now employ over twenty full time tradesmen and apprentices producing approximately thirty custom built plate aluminium power catamarans per year with a very respectable total of over 440 vessels in their 25 year history. In 2000 Sailfish built their own factory that includes 7 x boat building bays, spray painting booth, trailer building bay and 2 x fit up bays to deliver turnkey packages. Whilst recreational boats dominate sales, Sailfish have also supplied nearly 100 Commercial Series vessels for survey and working applications including Government Authorities, safety organisations and marine service providers, plus international exports to USA, PNG, Russia and New Zealand. A mere three years after the birth of Sailfish a partnership was formed with Sydney’s Webbe Marine. This partnership grows stronger to this day, now some 22 years later. In 1998 Sailfish also joined forces with Sports Marine in Western Australia further strengthening the national alliance and service representation. Success can also be quantified by the high volume of repeat business with satisfied customers often returning to update or upsize. Premium products also reflect high retainment value with Sailfish packages being eagerly sort after on the second hand market. Success has been further recognised by industry peers with the Canyon Master, S7 and S8 models both invited to the finals of Trade A Boat Magazine, Australia’s Greatest Boats awards for 3 years running, with the S7 taking out the Aluminium Award for 2015 and S8 in 2016. Sailfish are the only manufacturer to have won this award twice in the history of the competition. The Sailfish Catamarans future is here and now with the new and exclusive Hydroflow GEN 3 hull that offers unmatched performance, amazing efficiency, maximum stability plus lightning fast hole shot performance! The traditional “cushion of air” has advanced to a magic carpet ride with improved hydrodynamics providing the softest, most predictable and reliable off-shore hulls available. The sales network combines with innovative design and flexible manufacturing to customize your dream machine to suit your lifestyle. Who said the perfect boat will never be made? 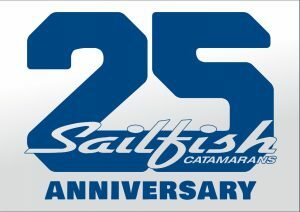 – Sailfish Catamarans have been doing it for 25 years! First ever Aluminium Catamaran to be approved for Volvo Penta IPS Installation.